The team behind the Spokane-based web series “Transolar Galactica” has just announced a Kickstarter campaign for their interactive mobile gaming app titled “Robot Rundown”. They are aiming to raise $3,500 to take the completed game and expand its reach. The iOS game had been available for purchase/download for Apple mobile devices in the Apple App Store since Thursday, September 18th for $0.99, but a successful Kickstarter campaign will expand the game to platforms like Xbox 360, Steam, and Android devices. The Kickstarter campaign will run from Monday, Oct 20 to Monday, Nov 3 2014, and will only receive funding if the goal is met by 8:00 PM that Monday night. 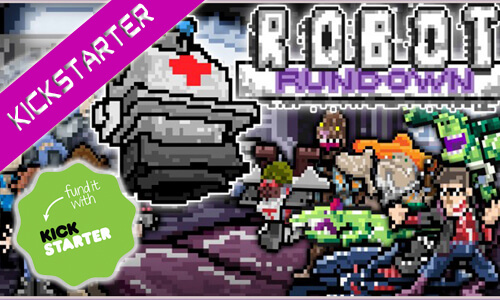 The game itself, “Robot Rundown” is a side-‐scrolling shooter‐style game that incorporates retro 8-‐bit artwork into its overall design. Utilizing both live-­‐action and animated HD Video cut scenes; “Robot Rundown” contains the sharp, self-­‐aware humor of its parent series while expanding the Transolar story world. The game design team is comprised of Adam Harum (Writer/Director – Transolar Galactica), Clancy Bundy (Writer/Production Designer – Transolar Galactica), Adam Boyd (Producer – Transolar Galactica), and Brandon Smith (Web Developer/Programmer – Vexing Media). The live action video elements of the game were also created using Spokane‐based acting talent and crew, helping the game come to life. Contributors to the team’s Kickstarter campaign will receive rewards, including a free copy of the game, access to a behind the scenes documentary showing how the game was produced, and even promotional posters designed by three Spokane-­‐ based graphic design artists/groups: Matt Bogue (Seven2/Baroque), Nick Tibbets (Seven2), and Derek Landers and Trevor Sullivan (Dumbgun). These artists jumped on board to create artwork inspired by the sci‐fi game. Celebrating its ninth year, the Independent Television and Film Festival has attracted the attention of the Industry’s Top Executives and VIP’s. Past VIP panelists include Mike Scully, Executive Producer of “The Simpsons,” and Jake Kasdan, Director/Producer for “Freaks and Geeks;” as well as writers and executives from FX, SyFy, Paramount/CBS, Comedy Central, “The Sarah Silverman Show,” “Reno 911,” “Prison Break,” “House” and “It’s Always Sunny in Philadelphia.” The festival took place September 26‐28, 2014 in Dover, Vermont. This year, ITVFest partnered with The National Academy of Television Arts and Sciences (or Emmy’s). The festival creates a direct path for the best indie TV artists to leap to the head of their industry. Last year alone, major network deals were signed just outside screening venues. This year Starz Digital actively sought content at the festival. “Transolar Galactica” was an official selection for the event, and the team was pleased to represent the city of Spokane and screen several of their recent episodes to a captivated and engaged audience, as well as have the Writer/Director of “Transolar Galactica”, Adam Harum, participate in an ITVFest Panel alongside industry professionals, to talk about the future of independent television. Please feel free to contact Producer Adam Boyd for more information about ITVFest, the “Robot Rundown” Kickstarter, and “Transolar Galactica”, or visit www.transolargalactica.com. Transolar Galactica is a sci-­fi comedy web series produced in Spokane, WA. Currently in production of its second season, Transolar is an independently produced video project that utilizes the local film talent and resources of the Spokane region to create a unique show that aims to put Spokane on the national map within the independent film industry.